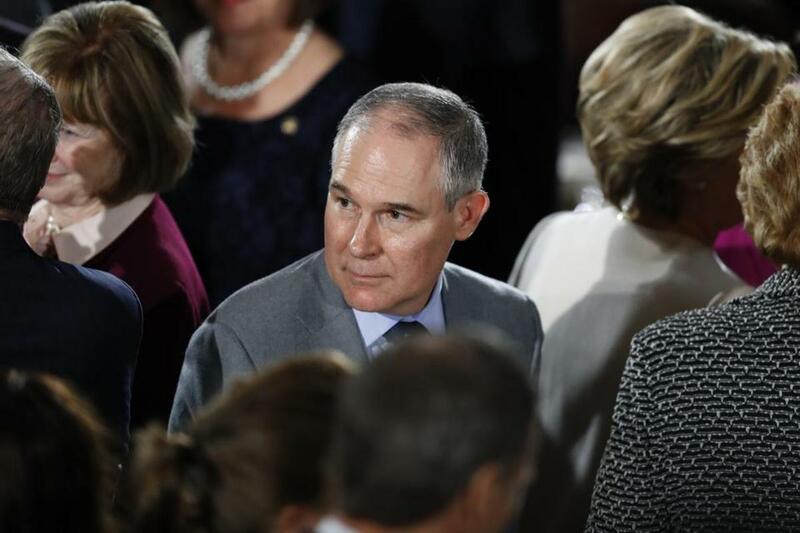 Oklahoma Attorney General Scott Pruitt, President Donald Trump&apos;s nominee to head the Environmental Protection Agency, arrived for the Inaugural Luncheon on January 20 in Washington. Donald Trump’s war on the environment has begun. In the first moments of his presidency, his White House.gov website went up, with a pledge to revive the coal industry, open federal lands to oil and gas drilling, and eliminate the Obama administration’s “harmful and unnecessary” climate action and expanded water pollution rules. Despite pledging “responsible stewardship of the environment,” Trump says he will “refocus” the mission of the Environmental Protection Agency. With such a declaration, Trump, who has called climate change a “hoax,” instantly betrayed all the feigned attempts by Cabinet nominees Scott Pruitt (Environmental Protection Agency), Rick Perry (energy), and Rex Tillerson (secretary of state) in their Senate hearings to soften their prior harsh stances. The Scott Pruitt we will likely get is the Oklahoma attorney general who sued the EPA 14 times on behalf of industry resistance to pollution regulation. We will likely get the Perry who once wanted to eliminate an Energy Department that gave unprecedented support to renewable energy under Obama. We likely will get the Tillerson whose company is battling in the courts over allegations that it concealed climate change research from investors. It is hard to see him upholding Obama’s global leadership on climate change. Thus, on his very first day, Trump lived down to the worst fears of people like now-former EPA Administrator Gina McCarthy. In a telephone interview last week, she said Pruitt did not reach out to her for a transition meeting. She hoped that Pruitt will see how many states (including Massachusetts under the Regional Greenhouse Gas Initiative) have reduced emissions and how many states, Republican red and Democratic blue, have left coal far behind with solar and wind energy. Trump’s views on the website take us back to a flat earth, declaring once more that climate change is a hoax.